Game description: The 3rd installment in the Fullmetal Alchemist RPG series and the only one to not be released outside of Japan. Valdora is a large city completely surrounded by snow-capped mountains. Edward, Alphonse, and Winry meet Sophie Bergmann, a fourteen-year-old girl with silver hair and light blue eyes who has been cornered by Leonid, the guardian of ice. When Edward's attempt to save her from him fails, she uses a strange power causing a blinding golden light to light up the entire sky. 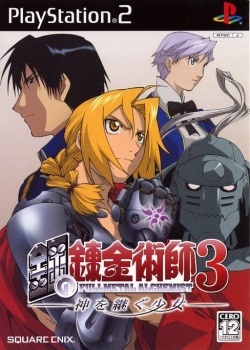 Fullmetal Alchemist 3: Kami o Tsugu Shoujo is the sequel to the story of Fullmetal Alchemist and the Broken Angel. This page was last edited on 16 April 2019, at 08:12.